Transparency Market Research has released a new market report titled “Automotive Sunroof Market - Global Industry Analysis, Size, Share, Growth, Trends, and Forecast, 2018–2026.” According to the report, the global automotive sunroof market is anticipated to expand at a CAGR of about 6% during the forecast period. Sunroofs, which were a part of luxury and premium vehicles until a couple of years ago, are currently, a part of high-end and mid-segment vehicles too. 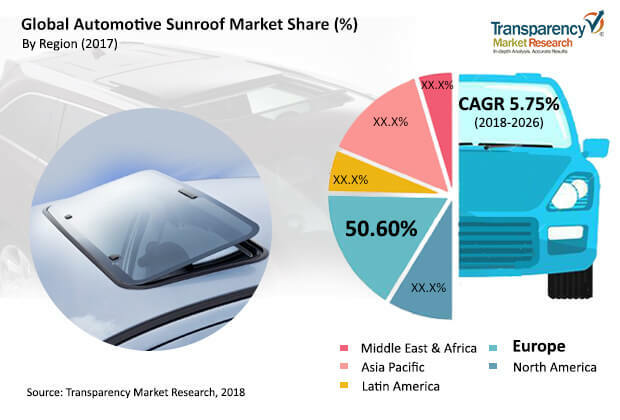 Increased competition among sunroof manufacturers, which has led to a decline in prices of sunroofs, increased per capita income, increased purchasing power, and expanding traveling activities have boosted the demand for vehicle comfort accessories, which in turn is driving the global automotive sunroof market. Sunroof enhances the vehicle exterior with its attractive appearance and allows sunlight to enter into the vehicle, which augments the esthetic appearance of the vehicle’s interior. Sunroofs that can be opened, permit natural air to enter inside the vehicle, which keeps the vehicle interior fresh and reduces the load on the air conditioning system of the vehicle; consequently, enhancing vehicle efficiency. Sunroofs are wide openings or massive transparent spaces that enable the vehicle occupants to have an extensive view of their surroundings and subsequently, maintain in-vehicle freshness. Considering these factors, sunroofs are quite popular among tourists and travelers. Presently, a variety of sunroofs are available in the aftermarket, which are preferred by vehicle owners who do not have OEM-fitted sunroofs on their vehicles. Reduced cost of aftermarket sunroof prompts consumers to install it on their vehicles in order to maintain in-vehicle freshness and enhance the esthetic appearance of their vehicles. Panoramic sunroofs held about 64% share of the total market, in terms of revenue, in 2017. Panoramic sunroofs are either fixed or open-able. Fixed panoramic sunroof is a massive transparent glass mounted on the vehicle roof, which allows only sunlight to enter inside the vehicle and provides a wider view of the surrounding. Generally, open-able panoramic sunroofs are two, wide glasses mounted on the roof, one for the front row seats and the other for passenger or back row seats. Panoramic sunroofs enhance the vehicle’s appearance and provide a feeling of openness, which primarily attracts consumers. Inbuilt sunroofs are smaller than panoramic sunroofs and can be opened. These type of sunroofs slide inside the roof and hence, provide a wider opening. Increase in vehicle electrification and rise in demand for vehicle sophistication are propelling the demand for electronically operated sunroofs. Most pop-up type and some foldable sunroofs are being operated manually, which are less expensive than electronically operated sunroofs. In the aftermarket, a variety of manually operated sunroofs are available that are inexpensive; however, increased per capita income and greater spending power are fueling the demand for electronically operated sunroofs. The electronically operated sunroof segment held a prominent share of the total market, in terms of revenue, and is likely to maintain its leading position in the market during the forecast period. In terms of material, the glass segment held a prominent share of more than 99% of the market. Glass is transparent, which permits sunlight into the vehicle and enables passengers to view their surroundings even with the roof closed. Glass is glazed in order to provide strength and to reduce the noise generated at high speeds. In modern vehicles, the area occupied by the glass is much larger than the area on vehicles incorporated with sunroofs a couple of decades ago. Passenger vehicles accounted for a prominent share of the global automotive sunroof market, in terms of revenue, in 2017. Increased number of passenger cars owing to increased car leasing and hailing activities and increased demand for in-vehicle comfort are primarily propelling the demand for sunroofs in passenger vehicles. Shifted consumer preference toward SUVs and premium class vehicles, owing to increased income, is likely to drive the demand for sunroof in passenger vehicles during the forecast period. Europe held a leading position in the global automotive sunroof market. Presence of global luxury and premium vehicle manufacturers, higher rate of adoption by consumers, increased popularity for panoramic and inbuilt sunroofs, increased disposable income owing to higher GDP per capita, high level of standards of living, and developed infrastructure are fueling the demand for sunroofs in Europe. Germany and the U.K., export luxury vehicles across the globe. The U.S. is a prominent importer of luxury and premium class vehicles from Europe. In 2017, Europe accounted for about 48% share of the global automotive sunroof market, in terms of revenue, and is anticipated to remain at forefront of the market during the forecast period. There are several key players in the global automotive sunroof market who hold prominent positions in the OEM market as well as aftermarket. The global market is highly competitive due to the presence of global players, such as AISIN SEIKI Co., Ltd., Inalfa Roof Systems Group B.V., Magna International Inc. Webasto, Inteva Products, Meritor, Inc., Yachiyo Industry Co., Ltd., BOS Group, Intensa, Johnan Manufacturing Inc., Signature Automotive Products, Whitehall Industries, Mitsuba Corp., ADVANTECH PLASTICS LLC, Arkal Automotive, Hyundai Mobis, and VUTEQ CORPORATION.